Windsor, ON: When news about break-ins at Habitat for Humanity's ReStore became public, ENWIN employees expressed concern for those whose future homes rely on the success of this organization. Over the course of three separate thefts, Habitat lost their building tools, materials and their truck. What they did not lose, however, was their sense of purpose and the support of their community -- including ENWIN employees! With upcoming builds scheduled, Habitat had no choice but to launch an emergency plea for help from the community in hopes of being able to retool in order to keep projects on schedule. And when they did, we responded -- as ENWIN Superheroes always do in times of need. An ENWIN Grassroots Fundraising Initiative, promoted by Aislinn Liolli, was moved up, and a fundraising blitz was launched. In just 36 hours, ENWIN employees donated $700. The total was matched by ENWIN for a donation grand total of $1,400. 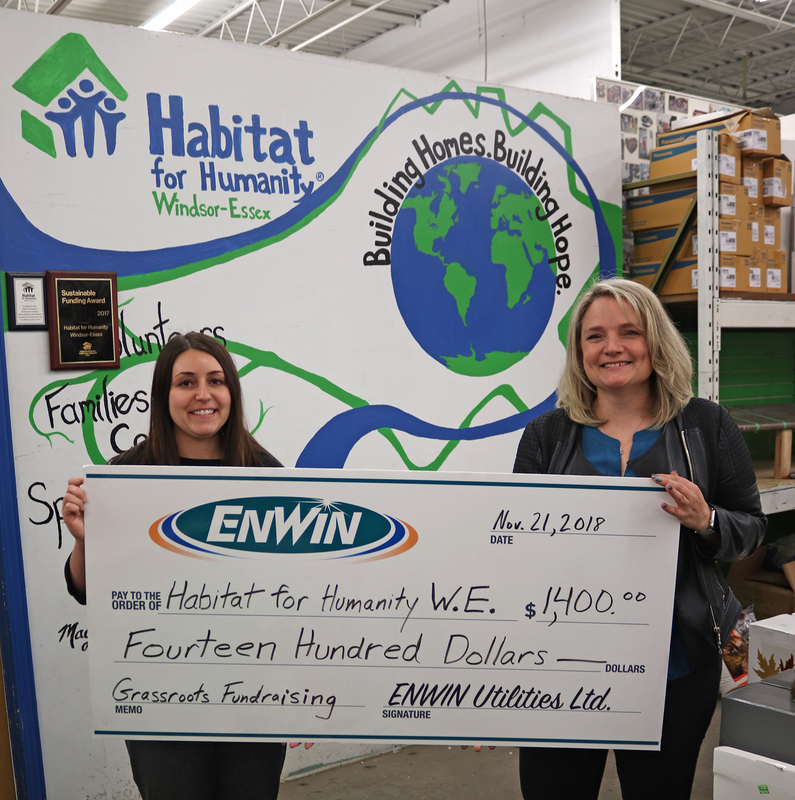 Aislinn Liolli (left) presents Fiona Coughlin, Executive Director, Habitat for Humanity Windsor-Essex with ENWIN's donation. "With the overwhelming number of donations we received from across Windsor-Essex, we'll be able to replace each and every one of the stolen tools," said Fiona Coughlin, Executive Director of Habitat for Humanity Windsor-Essex. "More than $25,000 has been raised and that ensures we can continue to build homes for families in need." Thank you to all who contributed towards getting Habitat for Humanity Windsor-Essex back on the job site!